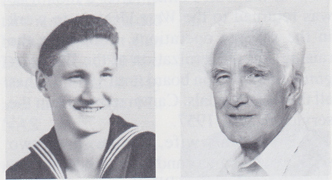 Wade D. Childs, Seaman 1/c, born April 12,1925, Lowell, WA, enlisted in the USNR March 23, 1943. He trained at NTS Farragut, ID, and spent a short time at NAS Whidbey Island, WA. He was assigned to the USS West Virginia while she was under repair in dry-dock at USNB Bremerton, WA. He was aboard the West Virginia through the Philippine Campaign, Iwo Jima, Okinawa and the Occupation of Japan. He was a 20mm A A gunner in the 11th Div. Memorable experience was entering Tokyo Bay on Sept. 1, 1945. Sl/c Childs was discharged Feb. 5, 1946. He and his wife, Vivian, have two daughters, Barbara and Lynne; three grandsons, one granddaughter and one great-grandson. Retired June 1, 1987, from Scott Paper Co. (Maintenance Dept. ), Everett, WA. He enjoys hunting, fishing, camping, bowling and travel.